James Henry has written four of these prequels, and I have listened to these two - read by David Jason (who else?). They seem to follow the pattern of the originals with a number of story threads happening concurrently - which the TV adaptation separated into different episodes, (and in my opinion the quality of the series was considerably the better for it). However although I thought the TV series gave a very faithful representation of the characters, it seems the original author felt it did not depict the gritty realism that he strove for in his writing. I do think that these books are more like the TV series, with a lot of Frost-style humour and less of the gritty... etc - but overall are quite a good pastiche, if that's what the author was aiming for. Enjoyable read - less of a focus on some moral or ecological "issue" of the day and more focus on mystery and suspense. It involves a cold case and all the usual suspects are in play to solve it. I was a little perplexed - or even disbelieving - about the premise which is obviously setting up the next book (no spoilers here) but I guess the author needs more scope for the characters. I've enthusiastically been waiting for this latest Max Wolfe story, and it was as good as I had hoped. Again for my personal taste I was less taken with the plot and story - which was as horrid as ever - but now thoroughly enjoying the back story. I hope it continues in a positive way, but I feel Max is a character destined for tragedy and loss, so I can't think how he will cope if he turns out to be happy. By the time I got to Wolverhampton it was early afternoon (not a cue for a song, sadly, although I'm sure it would have been a great one) and had just come on to rain. 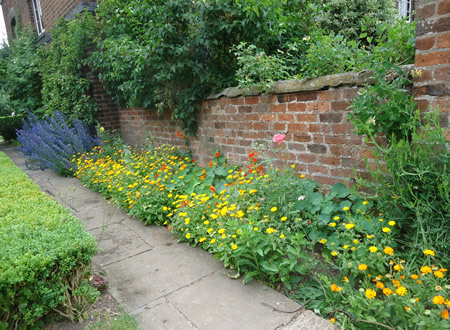 My destination was Moseley Old Hall, an Elizabethan farmhouse described as "atmospheric" - which it certainly was. I think it has rather lovely grounds and gardens but the weather was a bit grim for that kind of thing so I just snapped a couple of photos while waiting to start my tour of the house. 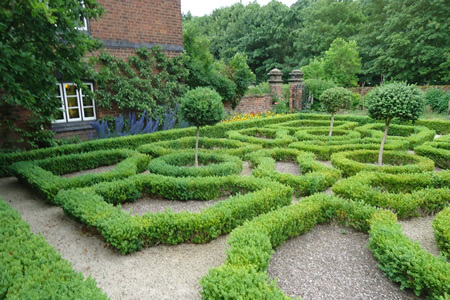 This Knot Garden was constructed it in 1962 using a 17th-century design. The main deal here is priest holes etc and the fact that Charles II hid in the house after his defeat at the Battle of Worcester in 1651. Indeed we started the tour entering the house through the same door used by him on his arrival, and later described in his memories of his escape dictated to Samuel Pepys. Although the tour is very geared towards kids, (as "50 things to do before you're 11 ¾ "), it was seriously one of the most exciting tours I have ever had at an NT property, narrated most passionately by one of the guides. Rather charmingly Charles seemed to have remembered (and substantially rewarded) all those that helped him escape in this period once he was restored to the throne in 1660. Not necessarily a trait associated with monarchs. 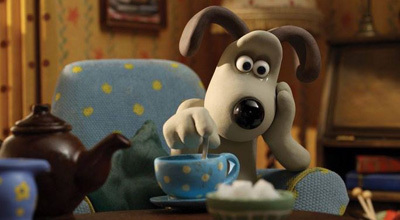 I managed a cream tea (ok just a tea) but I could not linger, as there was quite a way still to go. I paused to buy a few plants from the shop - I like to do this at NT properties when they are on offer - including a myrtle, a plant I never remember having seen before. Jennie tells me it is tender, which might be why, but it seems subsequently to have done quite well in its new pot. After 2 full days at Woolfest I was able to set off very early in the morning and take in 2 National Trust properties instead of one. The first was Keld Chapel and relatively close at hand (Shap - 40 miles away). Getting there was interesting - I followed the satnav using the postcode provided and ended up in a little close of houses in Shap (modern updates on stone cottages). I felt sure the chapel would be nestled in somewhere but I could not find it and my car was starting to be stared at ("you don't live here do you? "); anyway instead of sensibly asking someone (too embarrassed), I found that the NT website has google maps instructions, which took me right there. My original position may well have been close as the crow flies but was miles away by road. And what a road it was. Single track with high stone walls either side so totally trusting to luck not to meet anyone coming the other way. And once inside - it was so beautifully cool and peaceful. The interior is rustic, and the crumbling structure had left a thin deposit of fragments on the pews. This is not a sign of neglect, just what happens in old rustic buildings that have been put to varying uses over the centuries. 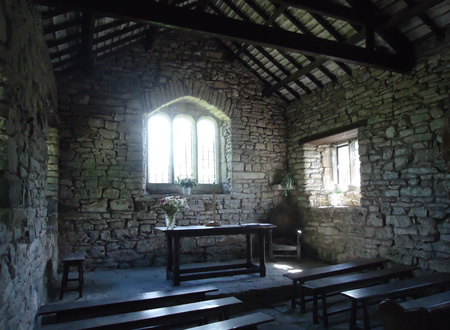 The date of construction of Keld Chapel is unknown; it may have been a medieval chantry chapel of the nearby Shap Premonstratensian Abbey or it may have been a simple chapel of ease with no connection to the abbey. 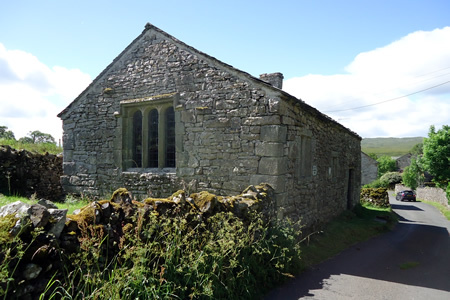 The first documentary evidence referring to Keld Chapel records a christening here in 1672. Towards the end of the 17th century the chapel ceased to be used for religious purposes and was converted into a house. In 1897 the building was repaired and during the 20th century it was passed to the National Trust. You can read a very interesting academic paper which really concludes that the only evidence it was ever a chapel at all is in the persistence of the name. There was a lot of interesting local information on a noticeboard inside about the history of the chapel, and attempts to have it pulled down, (letters to Parliament and so on). Given that it was saved, these are very amusing. 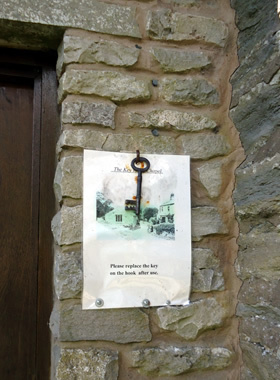 When it had ceased to be inhabited in the 1800s, Lord Lonsdale wanted the road to be widened enough to take a hay wagons through, and dismissed the claims that the building had any historic significance as a chapel. It's quite ironic looking at the village now. The road through it "goes nowhere" (more on that in a moment) and the requirement for road widening seems to have evaporated. Being somewhat loathe to go back down the single track road the way I had come (and did I mention the bicycle race?) I decided to explore the road out of the village the other way. The satnav had it as a possibility but there are many notices saying that the road is unsafe (crevices and weak bridge). I was suspicious that it was the large company that owns the land trying to stop people using the road but in the end I was too nervous to go on very far (even when an SUV passed me coming from the opposite direction). Yesterday I nipped into Keswick in the morning on a mission to visit the Herdy shop, and get more petrol. I decided to go over the hills at the mercy of the satnav - and it was all going splendidly - beautiful weather and scenery - until I came to a sign out of the blue saying "road closed". As above - loathe to just retrace my steps, I struck off in another direction which led me on a very winding road through 2 gates (I did not know that was even possible on public roads!) and using up a lot of petrol with very little progress towards civilisation - and leaving me panicking the entire journey about being stranded in the middle of nowhere. So these previous adventures were quite enough for me, and I set off back to the motorway as I had arrived. Due to a rather major misunderstanding - which I am not complaining so much about as it saved me a good deal of money in the long run - I booked myself an extra night in the hotel (lucky for me they had had a cancellation). So I had the whole day in which to look around in a more relaxed manner. In consequence I took in a few more demonstrations that normal. 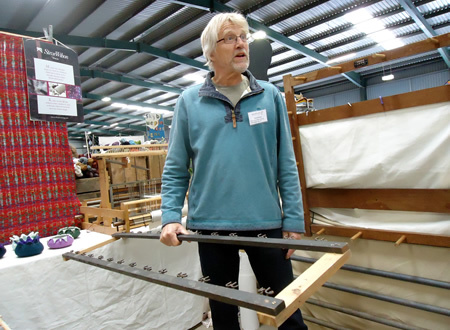 I also watched Steve Wilson demonstrating his speedy method of creating a warp, using a home-made kind of lazy kate on a rather large scale. He is obviously very creative and was very helpful in giving advice on making a similar device. 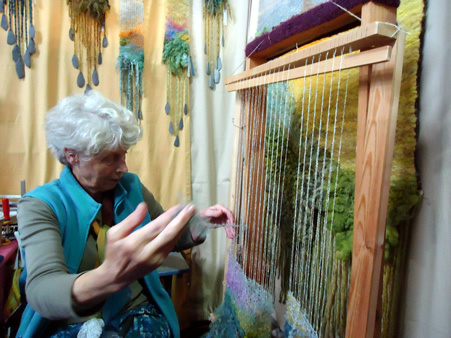 He went down a storm with the audience of serious weavers - for myself I fell it might be a lot clearer to me after I attend my weaving course in July and learn more about warping. Back at the hotel, I spent my evening with Nancy - an American academic with very liberal views (luckily) so it was very stimulating company for me - not to mention the knitting.... Last year it was all about Brexit, and this year all about the US president. ok ok - so you read it in the title.... and here we are again! How I love being in Cumbria - and for once the weather is really lovely. 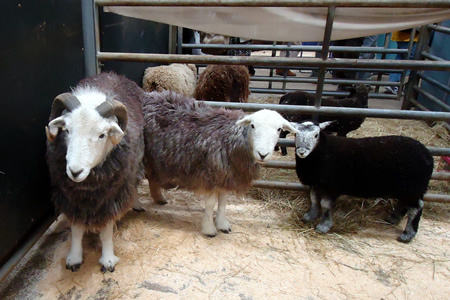 Today I spent the time shopping and watching the familiar Rare Breeds Parade. 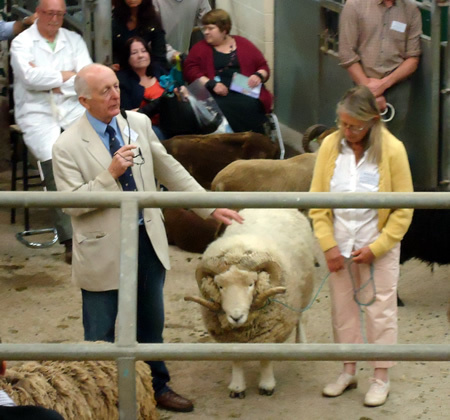 Peter Titley was as terrific as ever - and although I see this every year, it is always different as there are different animals in attendance. I think this was Terry - an Exmoor Horn. 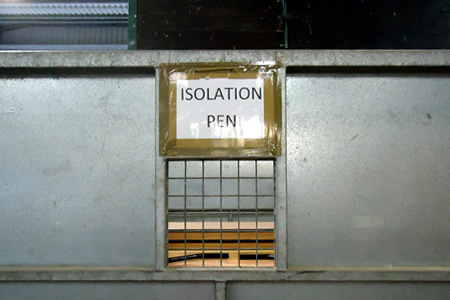 There was a notice on Terry's pen stating: Terry is a lovely ram but may be a bit grumpy because of the weather.... All I can say is - can't we all be? My shopping was a little lacklustre - basically I have all the fluff I can handle - but I loved the stalls and craftsmanship on display. 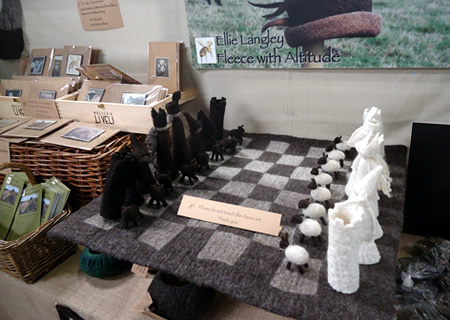 This chess set (above) really caught my eye - by Ellie Langley of Felt with Attitude. 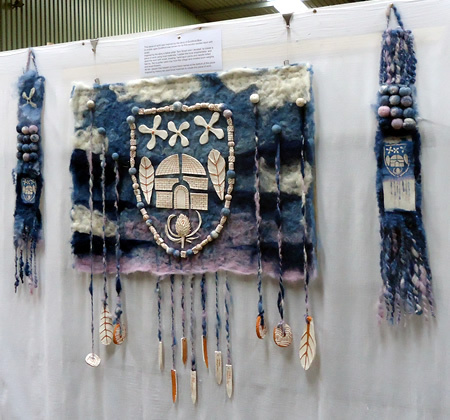 And this collaborative wall hanging interested me as it it was inspired by the story of Guildford Blue, the town being known in middle ages for this fine woolen textile dyed with woad. 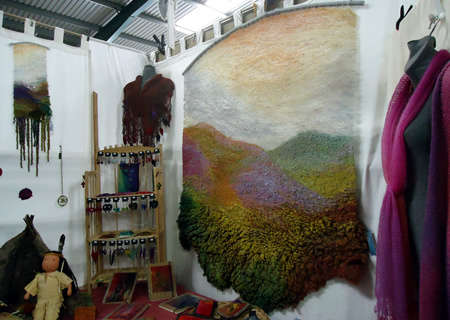 And just in case any of us gets overexcited in the fleece market - I noticed there is a handy place to calm down. Since the announcement about Sir Roger the "heavy heart" has been much used. For all that, I use it here as it exactly describes how I feel - not devastated or truly affected, as I did not know the man personally, but... well... sad. By all accounts he was a lovely unaffected man and that is just what we would like to believe of our icons. 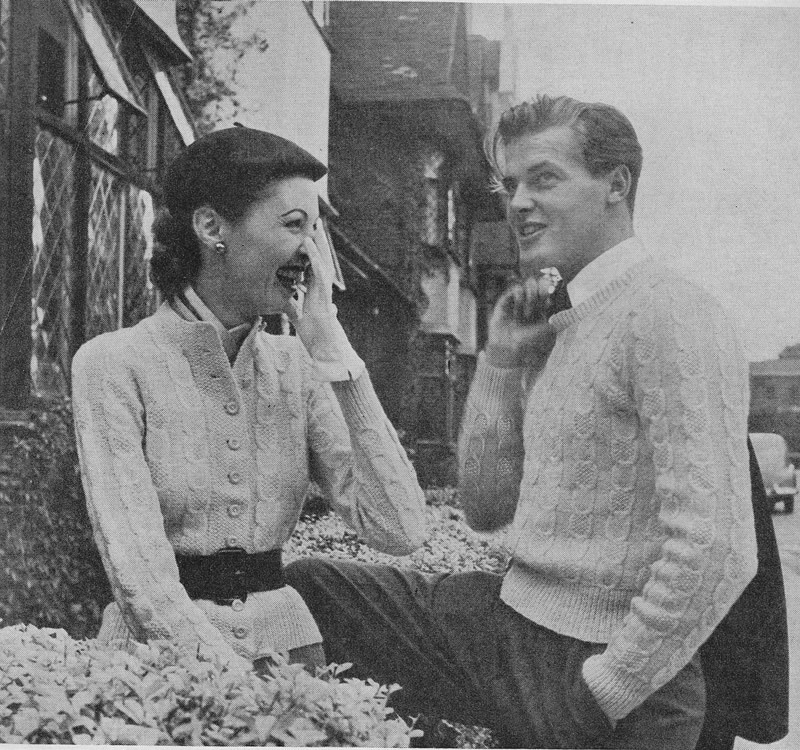 I always knew of his modelling career and as this is a "knitting" site I am marking it here. 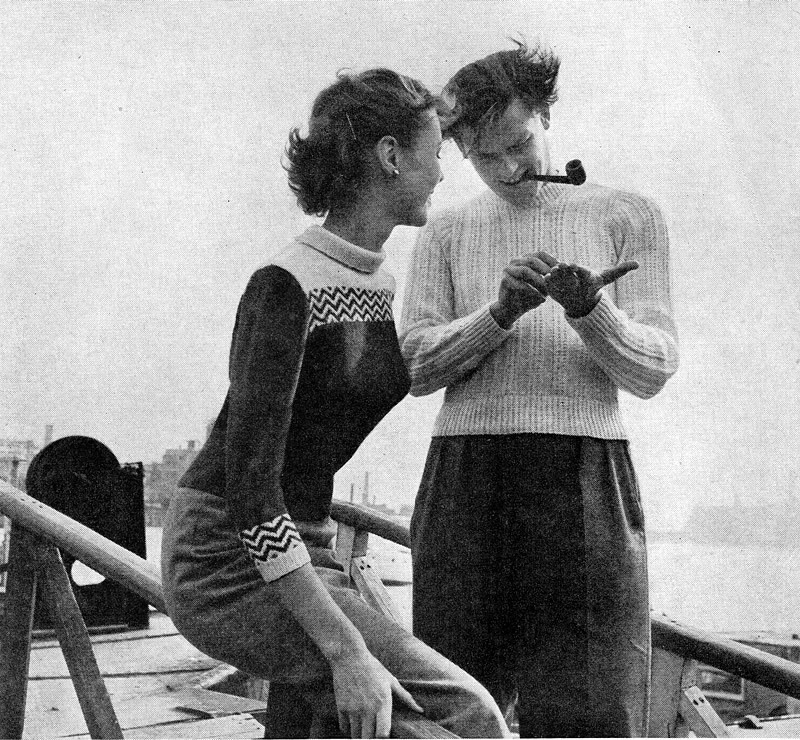 I am only sorry that he was made to feel uncomfortable about it in the 1960s; I cannot quite convey how deeply unfashionable knitting was in the 1960s - especially among the hip and groovy fraternity. But he lived with it - and now it takes on much less significance when compared with his subsequent achievements. He was always sartorially elegant - in The Saint his wardrobe is credited as being Mr Moore's own, and in The Persuaders, Brett Sinclair's wardrobe designed by Roger Moore. This idea appeals to me - see this fun blog. As a final note - what strikes me about these early photo shoots - with RM in his early twenties - is how much fun they seem to be having. I am not being naive here - I know that modelling is not as glamorous as the pictures - especially in that less technological era - it would have been hard work and you spent long hours stuck in implausible poses and inclement weather (windy by the looks of it!) trying to look comfortable and natural. But somehow they seem overall to be having a laugh and the joy of it shines through. A fitting memorial alongside the rest of the man who went on to become so very famous, and who dedicated himself in his later years to working so hard for good causes.